The last place Christopher Sanderson expected to wake up was in a comfortable bed in a richly furnished and adorned room, though he was surprised to be waking up at all. Bright sunlight from the large open window on his right momentarily blinded him, but he welcomed the warm breeze, the rustling of tree branches, and what sounded like friendly bird cries which were so different from the cries of dying men. Then it all came back to him and his beating heart began to race. He heard two quick knocks on the door which then immediately opened. A very large Japanese man entered carrying a tray. Christopher sat up in bed and noticed for the first time he had been dressed in silk pajamas. Last he recalled, he had been draped in rags soaked in sea water and blood. Without replying, the fearsome looking man set the tray down on a side table, stepped back, and then bowed. Not knowing what to do, Christopher nodded back. “If this is a Japanese prison camp, the accommodations are certainly a great deal better than I would have expected. The large man finished his bow and though the gesture seemed polite and genteel, his facial expression was one of hostility and even malevolence. Without a word, he then turned and left closing the door behind him. Christopher was directing his attention to the tray when he distinctly heard the sound of a lock being engaged. Perhaps he was a prisoner after all. Christopher Michael Sanderson was a well-known war correspondent for the London Herald on assignment in the South Pacific, reporting on Axis naval activity in the general area of New Zealand. That he was also an operative of British Military Intelligence was much less well-known but ultimately far more important, or it was until two torpedoes from a German U-boat sank the Merchant ship he had been aboard. He started to swing his legs out of bed and felt a twinge from his right side. Christopher lifted his pajama top and saw an impeccably neat row of stitches beneath a clean gauze dressing. When the second torpedo exploded, jagged debris struck his right side. His memory was sporadic after that. He recalled a lifeboat and three other men. The U-boat surfaced. Machine gun fire. What happened to Lieutenant Parks and the two others with him? Then he was in the water desperately grasping a piece of the lifeboat. It was large enough for him to climb onto. He was bleeding. He feared it would attract sharks. Where was the U-boat? No. That didn’t happen all at the same time. Christopher kept losing consciousness. How long had he been floating? It was bright and hot. It was dark and cold. It was bright again and he thought he heard sea birds. It was still bright and there was the sound of waves crashing. “Sashimi.” He had traveled before the war, particularly in the far east. He’d been in Japan twice and became familiar with the language and customs. One of the reasons he’d been given this mission. He found himself suddenly ravenous and attacked his meal with chopsticks and gusto. After his rather excellent breakfast (for he assumed based on the temperature that it must be morning), he discovered the lavatory facilities, as civilized as any to be found in the finest homes in Britain, and he was very grateful, not only because his experiences after the sinking had been so savage, but also because he was still locked in. Looking out the window revealed a panoramic jungle scene that could have been the illustration for a tale of idyllic pleasure or more likely one of mysterious intrigue. His silent waiter who most likely was or had been a professional Sumo wrestler, would make an unlikely surgeon, so someone on this island (he had to assume he was on an island) was an expert physician. Another knock and then the turning of a key. It was not the same person he had entertained before. “Good morning to you, Sir.” He looked like he could have been Japanese as well, but with some European ancestry. Well dressed in a white cotton suit and carrying what was most likely a medical kit. Behind him was a young woman in the traditional wear of a nurse, also Asian but perhaps Chinese or Korean. Christopher had been sitting up in bed but stood to address the person he believed was his host. “Mr. Christopher Sanderson. I’m a reporter for the London Herald.” He returned the bow. “Yes, quite, Mr. Sanderson.” He turned to the nurse and spoke to her in Korean which Christopher recognized but knew only in passing. She responded by deftly unbuttoning his top and removing the dressing. Ashida ministered to him and then presumably ordered Jae Eun to clean his wound and apply fresh gauze. Christopher heard a floorboard creak and looked past Ashida and his nurse to see Ikioi standing in the doorway. Ikioi bowed to Ashida and Sanderson, took the tray and left. “Not at all, Mr. Sanderson. I am simply recognizing what to me is obvious.” He bowed again. “Rest well, Mr. Sanderson.” He and the nurse walked out of the room. The door closed and the lock turned emphasizing what the reporter knew was the beginning of his strange captivity. Only Christopher and Ashida sat at the elegant dining table, both wearing formal dress (both men were about the same size so Sanderson’s wardrobe was on loan) and contemplating their after dinner brandy. “Are you talking about advancing human evolution artificially?” Sanderson finished his glass and set it down. Ashida lifted the decanter as an offer but the reporter shook his head. He wanted to think clearly should Ashida’s ego outweigh his caution. Sanderson awoke startled and saw Ikioi standing over him in his darkened bedroom. Christopher got up and started to light the lamp on the night stand. “Very well.” Christopher took his hand away from the lamp. There was enough light coming through the curtains for him to see, at least well enough to find the closet and some serviceable clothing, likely provided for anticipated forays in the surrounding jungle with the Sumo. He followed the Japanese man outside the residence, then down a trail and finally into a cave. Sanderson could hear the sound of water but it seemed muffled. Then Ikioi unlocked a barred metal door and opened it. It was only now that he produced a lantern with which he illuminated their way down steps. The sound of water grew louder. They had reached the foretold glass barrier and were looking down into an artificially lit lagoon deep underground. There were things moving in the water. When one surfaced and stared at them with coldly evil eyes, Sanderson gasped. Ashida had used the word “horror” but that barely described how the Englishman felt at seeing something that came so close to being human and yet missed the mark by so great a distance. If man were amphibious, he would look like this. It was intelligent the way a murderer or a fiend was intelligent. It was cunning, it lived to hunt, it saw Ikioi and Sanderson not as merely enemies but as food. One by one, the primordial creations of Dr. Ashida rose just far enough out of the water to watch the two men. The artificial environment was vast and Sanderson could not see the other shore of what he first imagined was a lagoon. Ikioi then led Sanderson back out and extinguishing his lantern escorted him to a cove he didn’t suspect existed. In the cove was a motor boat with room enough for two men and supplies. It was already loaded. In response Ikioi took several steps backward. “I suggest you leave now, Mr. Sanderson. The poison will be delivered momentarily and soon after that Ashida will go to feed his creations and discover them dead. His outrage will be magnificent and you do not want to be near this island when those events occur. “Good-bye, Mr. Sanderson.” He turned and started walking toward the island’s interior as Sanderson steered his craft out of the cove and into the open sea. Once underway, he made a more thorough inventory of his supplies. Included among the charts was a large folder containing all of Dr. Edgar Takeshi Ashida’s research. Sanderson had been placed in the horrible position of deciding whether to turn the information over to his government or dropping Ashida’s instructions for creating primordial monsters into the ocean depths. That also meant sacrificing the means to end world hunger. He imagined an artificial body of water underground with its surface littered with the floating corpses of a hundred abominations. He could see a brilliant madman jabbering hate and vengeance upon Christopher Sanderson, but even above him, upon Ikioi Yutaka who would be the first to die as a consequence of Dr. Ashida’s demonic vision but certainly not the last. I wrote this for the Photo Challenge #198 hosted at Mindlovemisery’s Menagerie. 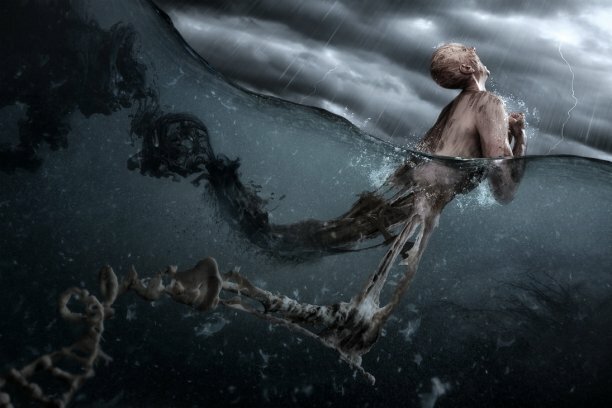 The idea is to use the image above as the inspiration for creating a poem, short story, or other imaginative work. The first thing I thought of when I saw the image was an oil spill in the ocean, which typically has devastating effects on marine life, but then a lot of people write about that. Then I saw the name of the image file was “primordial soup.” Next, I thought about aliens seeding our ocean billions of years ago so it would produce life only so they could come back and harvest us in the present as a food supply…literally primordial soup. However, I decided to take a different tack. I looked up the H.G. 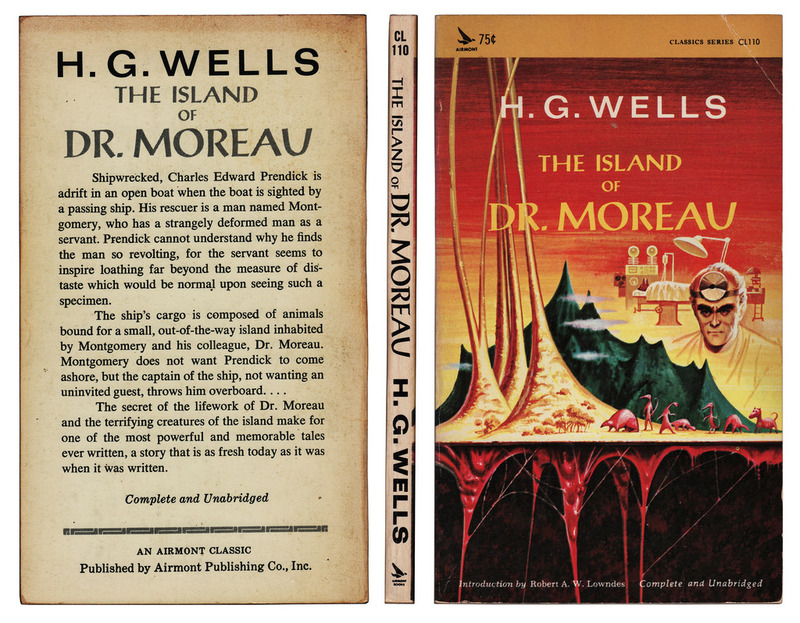 Wells novel (which I’ve never read) The Island of Doctor Moreau. I realized that the 1964 episode of the animated series Jonny Quest called “Dragons of Ashida” must have taken much of its story line from that novel (and yes, I named my antagonist after the villain in that cartoon). I also looked up the Marvel comic books character The High Evolutionary as well as a little blurb about problems with the Primordial Soup theory (and I was surprised to find a “tripod” website that was still online). Originally, I was going to have a Japanese submarine sink the Merchant vessel in the story’s beginning but then I found out that German U-boats were active near New Zealand in January of 1945 and so made the sub a U-boat just for giggles. I didn’t want to make the story so long, but I found it necessary to build the suspense. I was also going to have Dr. Ashida’s creations escape and kill him, proving he had control of nothing, but then I realized if even some of them escaped and made their way to the ocean, the world would have a whole new problem to deal with near the end of the war, and I didn’t want to write that story. Hope it wasn’t too anti-climatic. The curse of technology. Can be used for so much good, yet we keep using ut to murder each other. Great story, James!